When I first started copywriting, I had a real disadvantage. I had been a journalist, and the underlying belief -- at the time -- was that people are rational: You simply give them the facts, for and against, and they will make a reasoned decision. So when I started to see promotions that were working based on emotional appeals that seemed foreign and bizarre to me, I didn't understand. It took a while. But eventually, I came to realize what every successful copywriter realizes: that people are motivated by forces that had nothing to do with what I had learned in school, or on the job as a working journalist. 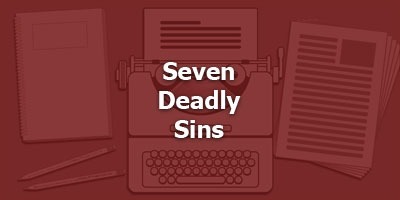 One way I came to make sense of all of this was by looking at what's known as "the Seven Deadly Sins." That is -- all of these things you were NOT supposed to do and feel, were, in fact, what motivated large numbers of people to act and to buy. That's what we'll be talking about today. If you are deeply religious or highly idealistic, I want to make one thing very clear: The Seven Deadly Sins we'll be talking about today are presented as obstacles to overcome. When I present this information, I'm not advocating for humans to be this way. I'm acknowledging that no human alive today has been perfected, to the best of my knowledge. This is about what I have observed... what actually happens, what motivates markets in the real world, where humans are mostly NOT rational. But there are people who can't get enough of anything. Think of all the wonderful wine clubs. Endless bottles of fine wines. Certainly luxury items. Nobody "needs" them. Why do they want them? You could say greed. Really, the first three are all about untrammeled desire. Most people have a hard time controlling all their desires, and if you can find a way to tap into a desire, it will make your copy stronger. Even people who are hard-working are lazy at some times. "The Lazy Man's Way To Riches"
Like with all of these, don't CALL your prospect lazy. Simply by contrasting the hard work required for other solutions and how much easier your solution is -- you'll make your point, and that can help you make your sale. People are REALLY angry these days. If you can show that you share their rage AND tie your offer to a solution out of that rage, it's a very powerful way to make a sale. This is my favorite - I think envy is fear of loss brought smack-dab into the present. Fear of competitors getting ahead of you. Well, there's another way to look at pride. Being proud of yourself. Being proud of your kids. Being proud of your team. Old headline: "Build a Body You Can Be Proud Of"
Lust, Gluttony, Greed, Sloth, Wrath, Envy, Pride. These won't do all the work for you, but they will point you in a good direction.